"We're going to pitch our product…" Dark Star Pictures has released an official trailer for a wild, indie, sci-fi western, dark comedy, "morality tale" titled Ghostbox Cowboy, which first premiered at the Tribeca Film Festival earlier this year. The film is about a dullard Texas entrepreneur who reinvents himself as a cowboy in China's tech wild west, but finds himself at the mercy of corrupt American expats looking to reinvent him once more. Described as an "excitingly fresh, complex perspective on China's economic growth – and the gold rush mentality it inspires." The film stars David Zellner as Jimmy, along with Robert Longstreet, J.R. Cazet, Nicholas Grgich, Specialist, Vincent Xie, and Nan Lin. This looks very, very strange and wacky and trippy as all hell. And oddly raw and unrefined, which may not be for everyone. You need to see. The story follows a wildly ambitious Westerner who tries to get in on China's tech boom and finds that he may not be up to the task. Texan Jimmy Van Horn (David Zellner) is a cowboy huckster who arrives in the booming city of Shenzhen with a couple of bitcoins and huge ambitions of parlaying them into economic success. Lucky for Jimmy, he's got a friend holding open the back door to this "accidental Shangri-La" — Bob Grainger (Robert Longstreet) – who's gotten new teeth, a blonde wig and looks 20 years younger. He promises to do the same for Jimmy in 6 weeks. 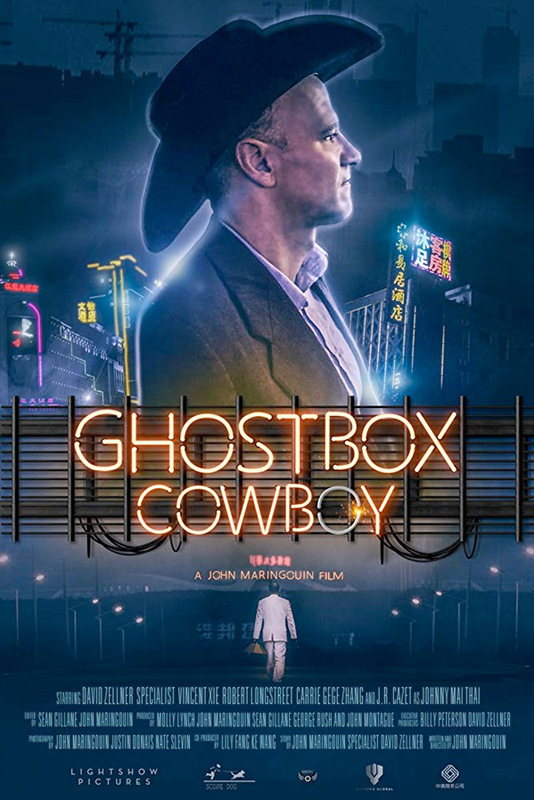 Ghostbox Cowboy is directed by American filmmaker John Maringouin, making his feature directorial debut after a few documentaries previously, including Just Another Day in the Homeland, Running Stumbled, and Big River Man. The screenplay is written by John Maringouin, from a story by David Zellner and Specialist. It premiered at this year's Tribeca Film Festival. Dark Star Pictures will release Maringouin's Ghostbox Cowboy in select theaters in LA starting November 30th, then San Francisco on December 7th, and New York on December 14th - plus VOD on December 11th.